When I was a kid, we had bicycles instead of cell phones. I’m truly grateful I did not grow up on an electronic leash. I lived a couple of blocks from Lake Michigan, in the suburbs of Milwaukee. There were half a dozen kids or more on my block, two of them girls my age, Elizabeth and Alice. Alice’s mother, a doctor, let us ride sitting on the back of her VW convertible, which says something about parenting in the 1950s right there. We spent our summer riding our bikes, usually with playing cards stuck in the spokes (one of my mother’s cousins owned a bicycle shop, so I had a better bike that I probably would have otherwise), playing softball and tag amid the oak trees on the boulevard, and reading. The library was right around the corner. Our parents only asked that we be home for supper, or before it got too dark, which was pretty late in the summer in Wisconsin. I was one of a group of eight cousins, five of us girls fairly close in age, and we spent a lot of time together. My dad’s family owned a summer cottage on Round Lake in central Wisconsin (my cousins still do) and we spent part of every summer up there, often my mom and aunts, me and my cousins, while our dads stayed in the city during the week. We swam, fish, fell out of the canoe, and wondered what was going on at the Campfire Girls camp on the other side of the lake. When I was very young we had an outhouse and a pump, but my uncle in the plumbing business fixed that in the mid fifties. We had to drive our trash to the nearest town from time to time, but the trip was fun. I still have a little wooden trinket box, with Wild Rose, Wis on the lid, that I picked up on one of those trips. Here’s a somewhat embarrassing picture from very early on at the cottage. I don’t believe I’ve been photographed in bathing attire since, and this photo may be the root of my reluctance. According to the caption, that’s my mom in the background, but it’s hard to tell. We moved to the suburbs of Miami when I was ten, but I spent a couple more summers with my cousins in Wisconsin before I settled into life as a junior high and high school kid. The weather was better in south Florida, but those summers in Wisconsin were hard to beat. 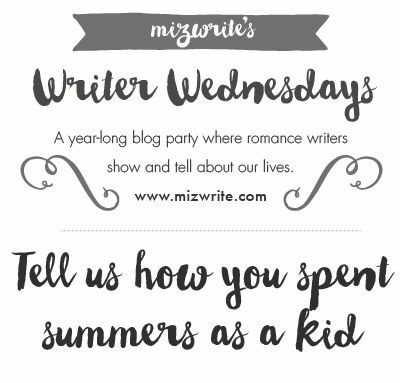 Hop over to the sidebar to visit the rest of the Writer Wednesday blogs, and join us again next month when we reminisce about natural disasters (let’s see, I’ve spent most of my life in south Florida, southern Louisiana, and coastal Texas—how could the weather possibly go wrong?). What a wonderful story, Kay. And I LOVE the photo. I too am happy I had the freedom I had during the summer. Hop on your bike in the morning, show up at dinnertime. No cell phones. No one tracking you. It was wonderful. And it’s a freedom my children will never know. Now I want a cabin in Wisconsin! I think that cottage is what I miss most about Wisconsin, and it’s been decades since I’ve been there. My cousin posts pictures on Facebook from time to time, and it still looks pretty much the same. Great post, Kay! The lake house sounds like a really cool place. Ah, no cell phones or other electronics, and kids could take off for the day without parents having to worry about them. Those were the days! I’m not a parent, Carol, but I have to think kids have lost something in this age of over-communication. Thanks for stopping by! What wonderful memories! I’m wondering about the culture shock, if any, when you moved to South Florida. It’s funny how different life can be in different parts of the US. Simpler, cell-free times. I have to say, on one hand it sounds wonderful. On the other, as a mom who’s a worrier, I like the security of knowing my girls can call me if they need anything. The biggest difference in moving south was just the climate, Pris. Everyone in south Florida back then was from somewhere else (I think I had ONE friend who had a parent born in Dade County) and my dad took a job in the same business (advertising) he’d been in up north. Miami in the fifties was almost a northern city with lower buildings and better weather. The bulk of the Cuban migration didn’t come until I was in high school. There’s nothing embarrassing about the photo. It’s adorable. So true about our childhood being so much richer than the electronic-enslaved kids today. I wanna spends summers in Wisconsin. I want to have all summer to read! Alas, that doesn’t happen any more. My hubs was born in Milwaukee and we often spend time on the lakes in Wisconsin. Lots of fun! How nice you had so many cousins to enjoy your summers with! The lakes are lovely — and then there’s beer, bratwurst, and cheese! I haven’t been back in a long time, but every time my cousin posts a picture of the cottage on Facebook, I’m tempted to find an excuse. No TV when I was a kid at the lake (for all I know they have cable and WiFi now! ), and not much radio reception that I remember. We spent a lot of time on what a southerner would call a sleeping porch, big screened windows, a long table, and several beds (one especially hard one was known as the Rock), playing cards and board games and reading. Thanks, Wendy. It’s hard to see myself in that picture–it was taken a VERY long time ago! I keep seeing this poster that says, “Your cousins are your first best friends,” and I think that’s so true. I love the story of your spending so much time with them! Bicycles, cards in the spokes, cousins, lakeside cottages … you had some dream summers as a child! Love it! Thanks for stopping by, Lauren. I like that thought, and it was true in my case. Half my cousins are gone now, alas, and the rest live far away. I miss them all.